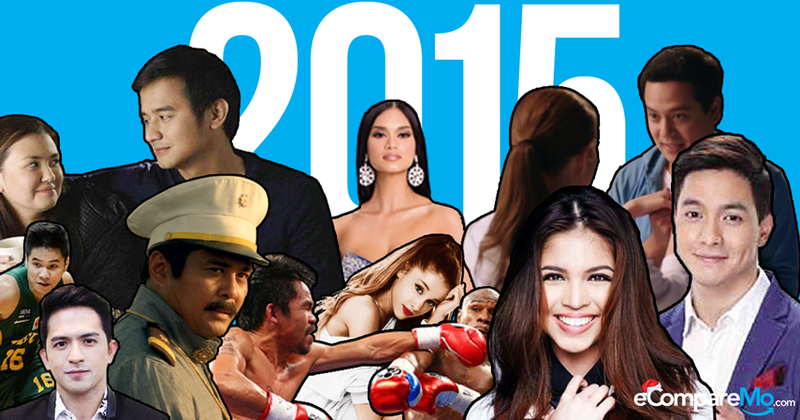 Get to know some of the year’s highest-paid celebrities, top-grossing movies, and other big Pinoy winners. Despite all the ranting and whining people did all over social media and the internet, 2015 has been a glorious year full of amusing new concepts, revelations, and historical wins. Let’s go through the some of the biggest (read: moneymaking) moments that shook up Philippine pop culture this year. The accidental duo of Alden Richards and Maine ‘Yaya Dub’ Mendoza made it to the top of Google trends in the Philippines for this year, as expected. The tandem also trended worldwide on Twitter with the hashtag #AlDubEBTamangPanahon, garnering 41 million tweets and landing them on international news sites. Noontime show Eat Bulaga! also raised Php14 million from their historic show at the Philippine Arena in October. Surprise hit Heneral Luna reached a Php240-million breakeven point, thanks to the film’s brilliant execution and gripping punchlines that got all of social media abuzz. The masterpiece directed by Jerrold Tarog and starred by John Arcilla is now the “highest grossing historical Pinoy film of all time,” and has even been made it as the first Philippine film nominated to the 88th Academy Awards to be held in February next year. After a long wait, Popoy and Basha fans were treated to the sequel to One More Chance in November. It is said the movie earned a staggering Php43.3 million on its opening day alone. Blogger Manila Uber Driver says an Uber typically partner gets a roughly Php34,560 gross income, with 12 passengers per day for six days a week. GrabCar, on the other hand, claims a driver can get up to Php48,000 gross per month. According to GrabTaxi managing director Brian Cu, a driver who works full time and meets incentives can take home up to Php70,000 a month. Though the actor did not reveal the exact figures, Dennis Trillo strongly believes that starring in the Iglesia ni Cristo biopic Felix Manalo has made him one of the highest-paid—if not the highest-paid—actors in the history of Philippine cinema. The movie had a budget of Php150 million, with 44 actors and actresses in its billing. A favorite among the entries of Cinema One Originals Film Festival. The movie reaped Php134 million gross income in just three weeks. The JM De Guzman-Angelica Panganiban tandem also resulted in an 8.8/10 rating on IMDB. Angelica Panganiban won the best actress award for her role as Mace, too. Information technology (IT) has been dubbed the best-paid specialization by Jobstreet Philippines. According to their Annual Salary Report 2015, people who work in IT, network system, and data base administration are the best-paid employees, across all position levels. Pacman donated around US$604,000 for a housing project of 150 units for the homeless in Saranggani, which the locals call Pacman Village. According to contractor Ricardo A. Marcellana, the amount mentioned covers only the cost of construction and does not include the price of the land that was bought a few years ago. Gone are the days when, due to security concerns, foreign artists skipped the Philippines on their Asian tour itineraries. But 2015 has served as an even further validation that they’re cool with us again. This year, big acts such as Ariana Grande, Katy Perry, One Direction held sold-out concerts in Manila, raking in seven- to eight-digit US dollars in earnings. World leaders and business titans coming over for the APEC Summit? We handled that one well too. The FEU Tamaraws snitched the championship trophy after beating the UST Growling Tigers in the finals. Mac Belo, who scored 23 points and nine rebounds, was awarded Most Valuable Player for the season and took home Php100,000 worth of savings deposit sponsored by PS Bank. The NU Pep Squad nabbed the top spot in the cheer-dance category and took home a Php340,000 cash prize.